Welcome to Resume Templates! Our online resources will help you to get the best job possible with our personalized help with resume templates. Contact us for Resume Help by one of our professional resume writers here in Australia. A person’s career is shown to be the most satisfying part of their working life and so the way to more job satisfaction is through better jobs, better opportunities and that means better resume templates. The process of applying for a job is stressful and time consuming. First you must find the job that you like and then set about portraying yourself in an appealing way so that the employer will have no choice but they give you the best job! To take away the stress of this and to put your best foot forward, resume templates is a great way to ensure success. 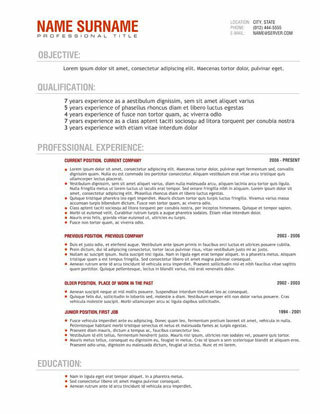 A resume template will offer the necessary information that is required for a resume, plus the format and how to present your working details in a logical and attractive way. By using a resume template you are ensuring that all your details are correct and exactly what the employer is looking for. We offer resume templates for all business areas; from marketing to hospitality and government positions. We have done the research to find what must be included in a resume, and produced the templates, so that success in job application is all but guaranteed. Resume Templates is a great way to take away the stress from writing and presenting a resume so that you can focus on what you need to do when you are given the interview. Good luck because resume templates are going to get you your next dream job!